It’s only Alfonso Cuaron’s eighth feature film, but the Oscar-winning director of Gravity says he wanted to make “Roma” for years. It’s already being hailed a masterpiece and a major awards player. Also, it is the only film this season to land at all three major film festivals (Telluride, Venice & Toronto). I was skeptical of a black and white movie with subtitles that garnered such overwhelming praise. In fact, “Roma” does live up to all hype and will have a somewhat indescribable effect on the viewer. “Roma” (Amor “love” spelled backwards, and the name of the town the film is set) is the most personal film in Curaon’s filmography and is semi-autobiographical, though not told from his point of view. Simply put, “Roma” is the most humbling cinematic experience of the year, that repeat viewings will offer context and artistic treasures for years to come. Wash away the dog poo on the carport each morning, help the four children get dressed, fed, and off to school; only then does Cleo’s day of washing, cleaning and laundry begin. Not a family member by name, but Cleo (Aparicio) and Adela (García) keep Dr. Antonio (Fernando Grediaga) and Señora Sofia’s (Tavira) household functioning. “One for the tamales, two for the tacos,” the young women say, doing their evening exercises before bed. Outside of their household duties, both have their own lives. Cleo is dating Fermín (Guerrero), a cousin of Adela’s boyfriend. The children of the house adore Cleo, even more than their mother, who is dealing with her own personal issues. Cleo’s personal life takes an unexpected turn that will dramatically change her upcoming year. It will be difficult to find another film in 2018 that matches the artistic integrity and quality of Roma. “Roma” is Cuaron’s first Spanish language film since “Y Tu Mama Tambien” and like he did with that classic, he takes his time to tell a story. We are allowed to soak in the details of every scene. So vivid and alive, you can smell the Fabuloso (or in this case Roma brand powder soap) when she mops, salivate at the chime of the street vendors and the tamales they bring. The details are what make Cuaron films so inviting and unforgettable. His script shows the parallel lives of two women of different classes dealing with similar struggles. 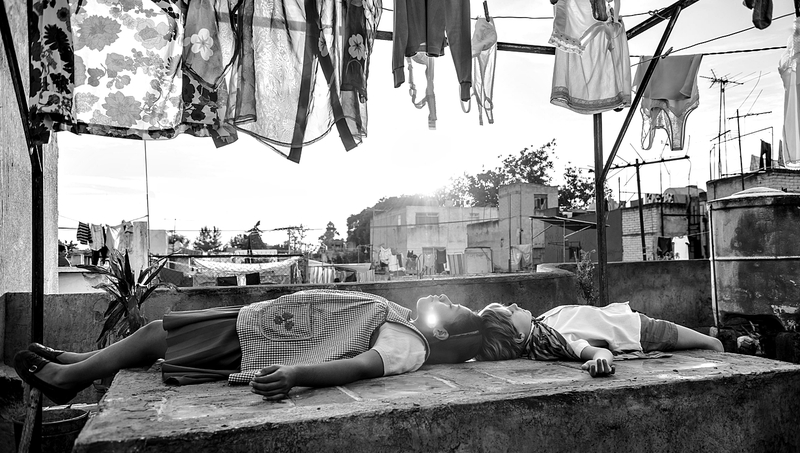 “Roma” is gripping when you least expect, heartbreak creeps up without warning, and you may find yourself nostalgic for that place and time whether you are from Mexico or not. Cuaron is so thorough with character development, you will truly feel as if you know these people personally. It is beyond all doubt that this family loves Cleo, they depend on her and they cry with her. Yet in a scene where Cleo needs medical attention, the grandmother (Verónica García) of the family is asked by medical staff about Cleo’s middle name, age, and date of birth, to which she sorrowfully replies “I don’t know.” How we often take the most important people in our lives for granted is one of many important messages Cuaron’s gets across. Illustrative irony also plays an important part in how “Roma” is structured visually. In one scene where Cleo is desperately searching for Fermín, after traveling so far, wading through mud, we see a political demonstration behind her. Or how the children beg to go play on the beach during vacation, after Cleo has suffered the most devastating moment in her life, and she simply smiles and goes along. Black and white cinematography has never looked so beautiful as it does here. The sound design is the viewer’s passage into Cuaron’s authentic world. Aparicio’s performance is both haunting and completely profound. It will be difficult to find another film in 2018 that matches the artistic integrity and quality of Roma. Cuaron offers a beautiful cinematic masterpiece to the world that’s visually and emotionally breathtaking.